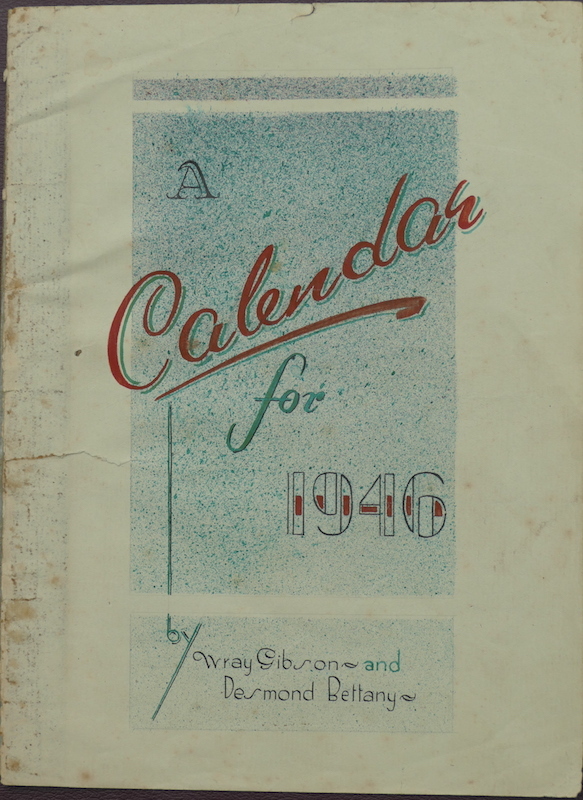 This 1946 Calendar was probably painted and put together after the surrender of the Japanese in August 1945 and prior to embarkment on ships back home. The POW needed to spend some months receiving medical attention and putting on some weight after their starvation diet. Des and Wray probably worked together on this project, to break the bordom. All images have been painted by Des. The illustrations in this calendar depict incidents (many of them captioned) which occurred in the lives of camp prisoners since 1942. Among events illustrated are the forced march of prisoners to Changi, the award of one tin of pineapple per 10 men in honour of the Japanese Emperor’s birthday and the construction of an airfield for the Japanese. There are also humorous scenes, such as a prisoner eyeing a well fed chicken, and a snoring prisoner’s ‘one man concert’. The final illustration is captioned ‘Lest we forget, this must not happen again or we perish’, and shows prisoners lying on their wooden beds arranged in rows outside a reed hut. Source: A Doctors War, by Dr Rowley Richards, pg 157, Harper Collins Publishers, 2006.